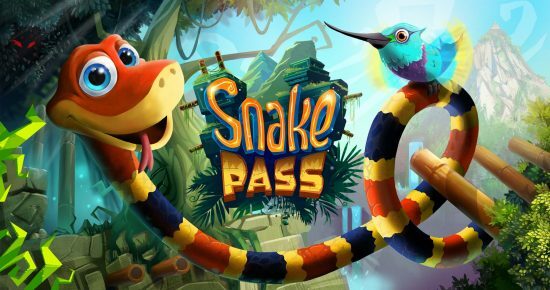 Snake Pass on the Nintendo Switch is a fun game that became surprisingly addictive very quickly. While the first few levels were quite soothing and relaxing, soon I was perched on the edge of my seat trying to successfully navigate my way across a bamboo pole with dangerous spikes lying beneath me and the gem I sought taunting me from where it was perched precariously atop a nearby pillar. The game is best described as a physics based puzzle platformer, and sees you controlling Noodle the Snake as he explores the different levels on the world of Haven Tor. Mysterious forces are at work, and he must search for the missing Keystones to unlock the magical Gates that give Haven Tor its power and in so doing proceed to the next level. Snake Pass may seem simple at first, easing you into learning the controls to direct him forward or speed him up, raise his head to help him over obstacles, learning to wrap tightly around bamboo posts to navigate onwards and upwards, and asking his Hummingbird friend Doodle to help give him a lift to higher areas. Yet before long the levels will become more challenging, you will need to solve more puzzles and really hone your snake directing skills. 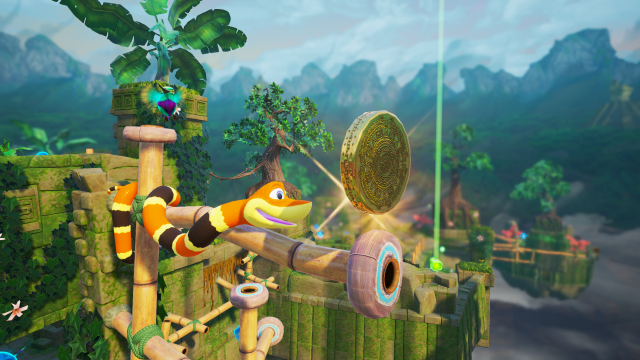 There will be switches to unlock, levers to pull, balls to roll into holes, platforms that spin and more, making the game progressively harder. 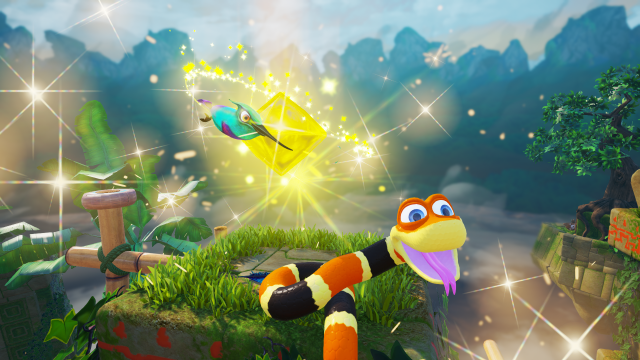 If this sounds easy, it’s not – remember that you’re a snake with no arms or legs so will have to wrap your snake body around the objects to move them. The checkpoint system in the game can oft times be frustrating, sometimes forcing you to repeat overcoming an obstacle you just spent a considerable amount of time on, and the camera can also prove to be a tricky companion. 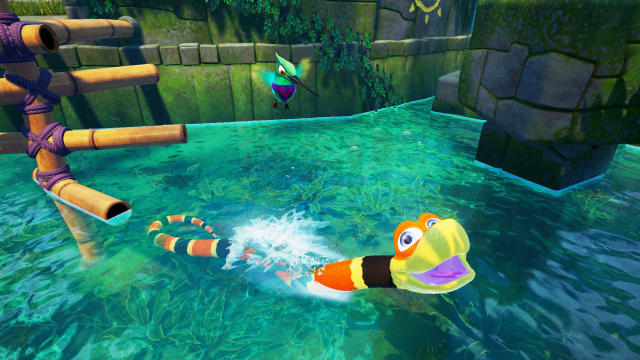 In addition to collecting the three Keystones, each level has both coins and bubbles to collect. 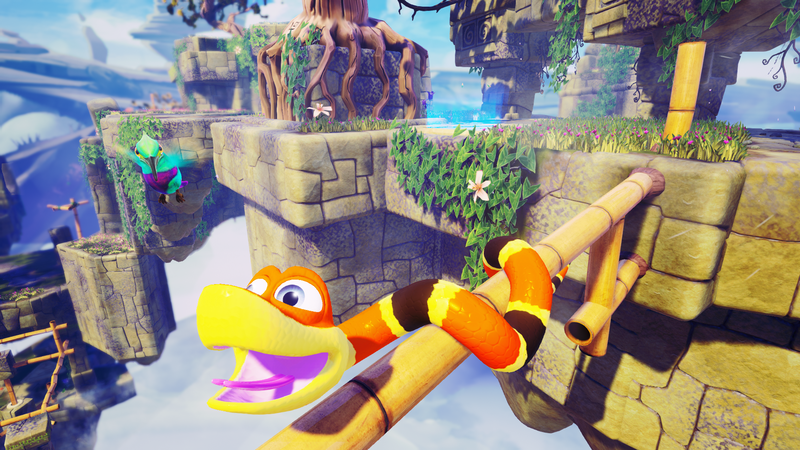 You will most likely want to go back to complete collecting all these items, many are placed in tight spots that will require serious snake skills to access them. But let’s be honest, even collecting the Keystones will see you plunging off the different platforms floating in the sky many times, or landing on spikes over and over again as you don’t quite make the crossing between platforms…all the while you desperately ask Doodle to lift you but realise he can’t as you fall away into oblivion. As you move through the 15 different levels, you will notice the new environments and music. While the beginning levels may be vibrantly coloured jungle-like areas with crabs that scuttle nervously into their shells, dragonflies that float lazily past you, or fish that dart away from you as you search underwater past luminescent plants, you will soon move onto areas that are fiery red by design with flaming ivy and flowers, and with traps that now include burning coals and different challenges. 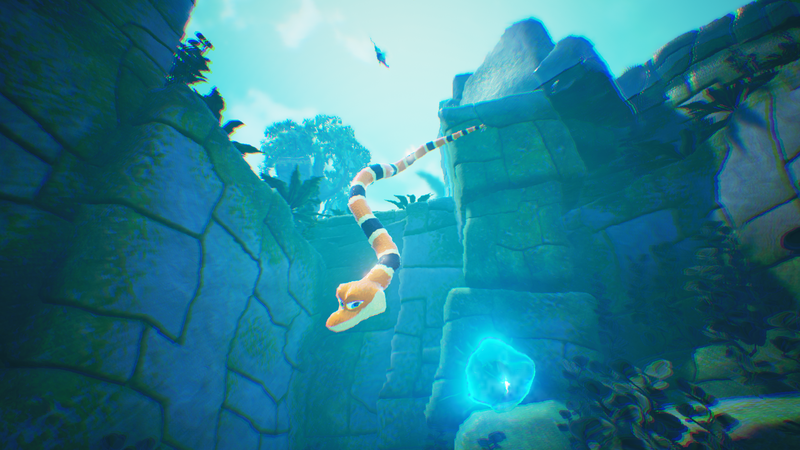 Noodle the snake, though an unlikely hero at first, will soon slither into your heart, and will keep you coming back for just one more level. In fact, trying to pry the controller away from your husband who wants just one more go can be challenging in itself. And hearing shouts of ‘Mom I want to watch the Snake’ and then ‘make him swim Mom,’ ‘let the bird help him Mom,’ after nap times on weekends have become commonplace too. While older kids may be able to control Noodle for the earlier levels, they will no doubt struggle to navigate the later levels (all depending on their level of skill of course). Yet it’s a great game for kids to watch you play, and very entertaining to boot, with my daughter often giggling at Noodle’s frightened expressions as he clung onto the bamboo pole or smiled as you successfully located a Keystone. It is a great fit for the Nintendo Switch in handheld mode, and worked well for me to sneak in some gameplay during afternoon naps. Snake Pass is available for the Nintendo Switch on the Nintendo eShop, and is well worth the reasonable price tag of R260.